When it Makes Sense to Utilize Private Real Estate Investments | Passive Income M.D. 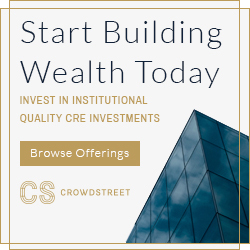 This is a guest post from Clint Thomas & Justina Welch of Integrity Wealth Solutions, a flat fee financial planning and wealth management firm with a great understanding of how to integrate real estate investments into your portfolio. This is not a sponsored post but they are a sponsor of the site and one of the few on our exclusive recommended financial advisors list. It is common knowledge and an accepted practice to diversify an investment portfolio – spreading risk over multiple sectors of the market with the intent to lower volatility while obtaining a solid rate of return. The central idea is that different segments of the market zig and zag at different times and a diversified mix of assets can take advantage of rising markets with growth-oriented investments while providing some protection in a down market with more conservative investments. Many investors diversify across the core asset sectors, such as bonds, US stocks and possibly foreign stocks. While others might go a step further and diversify into publicly traded real estate investment trusts (REITs). However, many investors neglect a huge asset class when constructing their portfolios, and that is commercial private real estate. Public REITs represent about a $960 billion market whereas U.S. commercial real estate represents a $13 trillion market. In fact, commercial real estate is the third largest asset class behind U.S. traded fixed income and the U.S. stock market. For the qualified and the appropriate investor, private real estate can empower investors to access this cornerstone asset class and compliment their portfolios with a range of benefits. Modern portfolio theory suggests that the most effective way to maximize returns while at the same time minimizing risk is to add uncorrelated or low-correlated assets. Within the context of multi-asset portfolios (composed of stocks, bonds and other asset classes), commercial real estate may provide significant benefits, as correlations with stocks and bonds over time have been low. While we are a big believer in adding public REITs to a diversified portfolio, there can be additional benefits to adding private real estate to gain even greater diversification. As you can see from the below chart, public REITs have a fairly high correlation (0.74) to the US stock market while private real estate has a much lower correlation (0.20). 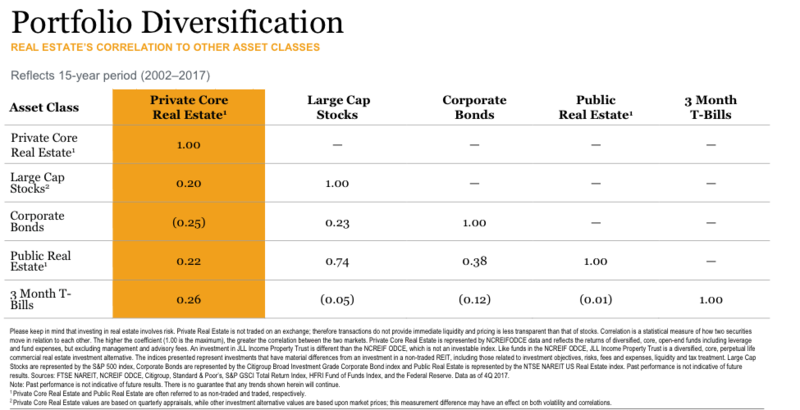 High-quality core commercial real estate as an asset class has had strong historical performance with a lower standard deviation (volatility) than public REITs and the US stock market over the last 15 years. Private real estate delivered an 8.3% average annual return over the last 15 years with about half the volatility of the S&P 500 and a third of the volatility of public REITs. Sources: NCREIF, Standard & Poor’s, Citigroup, Federal Reserve. 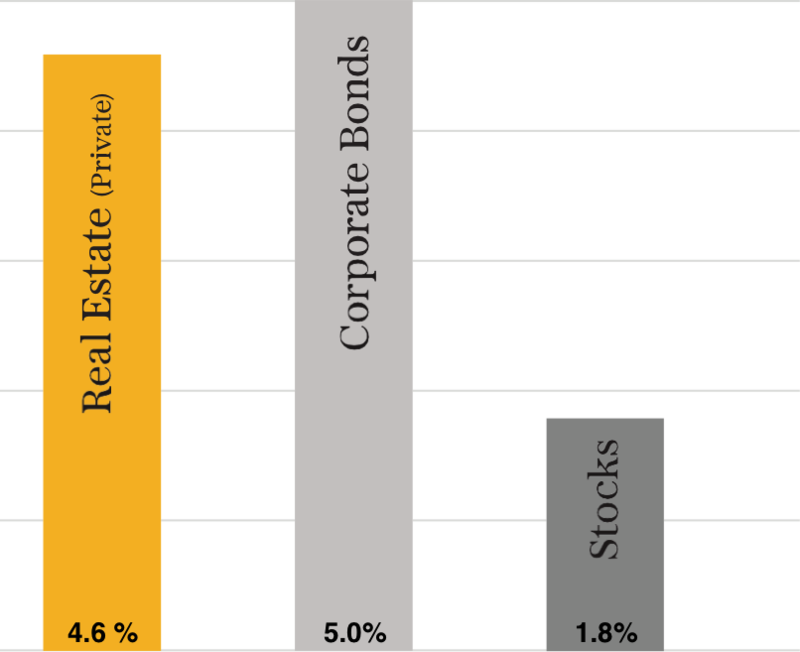 Real Estate (Private) is represented by the NCREIF ODCE gross total returns. NCREIF ODCE data reflects the returns of diversified, core, open-end funds including leverage and fund expenses, but excluding management and advisory fees. 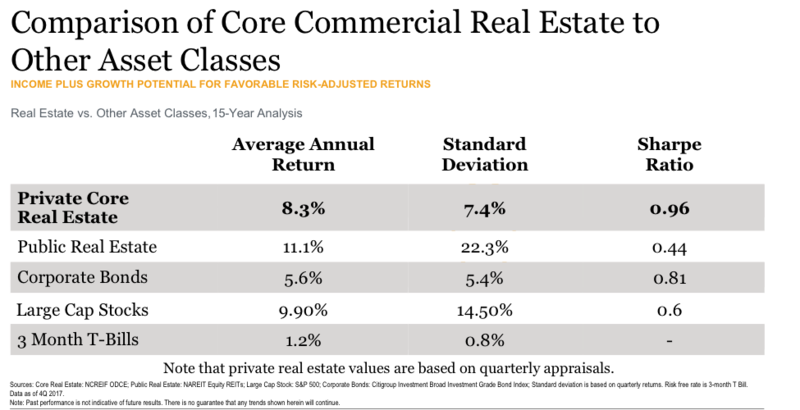 Returns presented are net of fees. NCREIF ODCE is not an investable index. Private real estate is not traded on an exchange and has less liquidity and price transparency. Stocks are represented by the S&P 500 Index and are subject to market risk. Corporate Bonds are represented by the Citigroup Broad Investment Grade Corporate Bond Index and are subject to credit risk. T-bills are represented by the U.S. Government 90-day T-bill and are subject to interest rate risk. Government bonds and Treasury Bills are guaranteed as to the timely payment of principal and interest. Indices are meant to illustrate general market performance; it is not possible to invest directly in an index. The indices presented represent investments that have material differences from an investment in a non-traded REIT, including those related to investment objectives, risks, fees and expenses, liquidity and tax treatment. The value of a private real estate fund is based on the actual value of property held by the fund. Conversely, in a public REIT, the share price value is determined by daily market forces, which means the share price of a public REIT may not reflect the actual value of the underlying real estate. 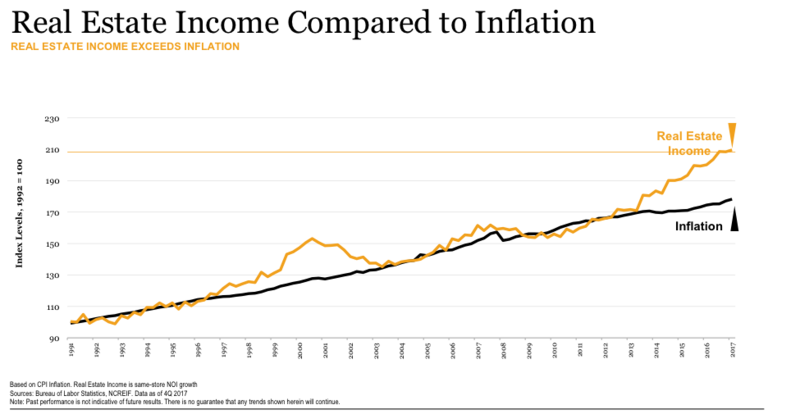 In some cases, the share price can value the REIT 30% higher or lower than the actual value of the underlying real estate. Private real estate values don’t move much daily but rather appreciate slowly over time, which is why private investments are less volatile than their public counterparts. Both vehicles have pros and cons and the optimal portfolio has a combination of both. Public markets offer liquidity, but that comes at the expense of volatility and private investments offer investors low volatility, but with that comes illiquidity. Income has been an essential component of the attractive long-term total returns provided by commercial real estate as an asset class. Historically, 70% of the total returns from commercial real estate, according to the NCREIF Index, have come in the form of income rather than capital appreciation. Over the last 20 years, the annual income returns generated from investing in commercial real estate have been more than 2.5 times higher than stocks and lagged bonds by only 50 basis points. Real estate income over the last 25 years has increased at nearly the same average annual rate as inflation (2.92% vs. 2.31%). In contrast, bonds are a “fixed income” investment, which means the income they generate does not increase with inflation, exposing the investor to the risk that inflation will erode the value of future interest payments. Similarly, principal payments do not grow at maturity, whereas real estate may appreciate over time, especially during periods of high inflation. Investing in commercial private real estate is not for everyone. 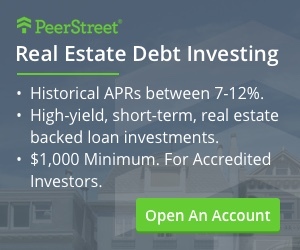 Generally, to invest in private real estate one should be an accredited investor, which means a minimum net worth of $1 million excluding the value of the primary residence or have an annual income of at least $200,000 over the last two years. Another thing to keep in mind when allocating to private real estate is the fact that it’s typically illiquid, which means an investor’s capital may take months or years to unlock. So real estate is not an ideal investment for those who need capital in the short-term for living expenses or college tuitions. However, the illiquidity of private real estate can be a benefit as it may help stave off knee-jerk reactions during a market sell-off. The ideal allocation to private real estate depends on each individual investor’s situation, which is a combination of their net worth, time horizon and short and long-term goals. Have you considered utilizing private real estate investments to diversify your portolio? 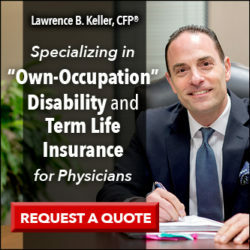 This is a guest post is from the principals of one of our recommended financial advisors, Integrity Wealth Solutions. Integrity Wealth Solutions is a flat fee wealth management firm that specializes in asset management and financial planning. They have extensive knowledge in how to integrate real estate investments into your portfolio. Previous articleI Tried to Cut the Cord. I Really Did. You are definitely preaching to the choir here. 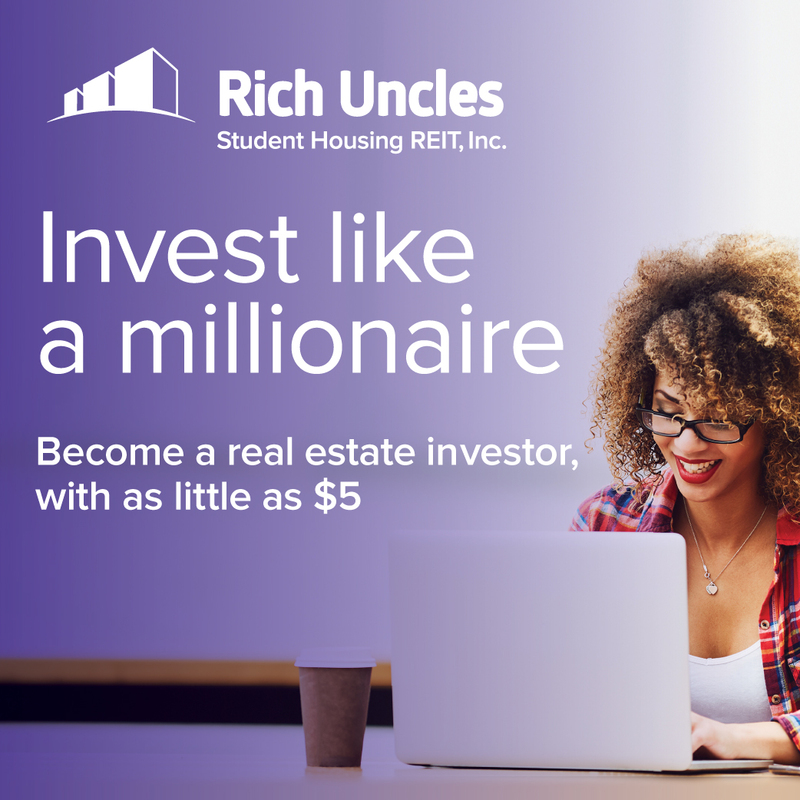 I am a HUGE fan of commercial real estate and have exclusively invested in this asset class since May 2017 when I first realized about its potential. All the points you make were what sold me on this asset class (low volatility, low correlation to the market, great passive income stream). The particular class I invest in is the multi-family commercial apartments (class B). This appeals to me as it is an evergreen asset (I feel there will always be a demand in the future). In my blog I have several posts that have described my particular take on this type of investment (A credit to your name, What’s the Alternative?, etc). I think there are always opportunities even though there are some segments of the country and property type that have seen some major appreciation. Even if a particular property has seen appreciation, the value of the investment is a function of appreciation plus the income potential. So if the income potential for the apartment complex or industrial building for example is strong, the fact that it has appreciated recently is not a major concern over the long term. However, like any other investment one has to evaluate the purchase price and determine if it is under-valued, fairly valued or over-valued relative to other similar options that are available. I think there are always opportunities out there even though there has been some massive appreciation in different segments and different areas of the country. 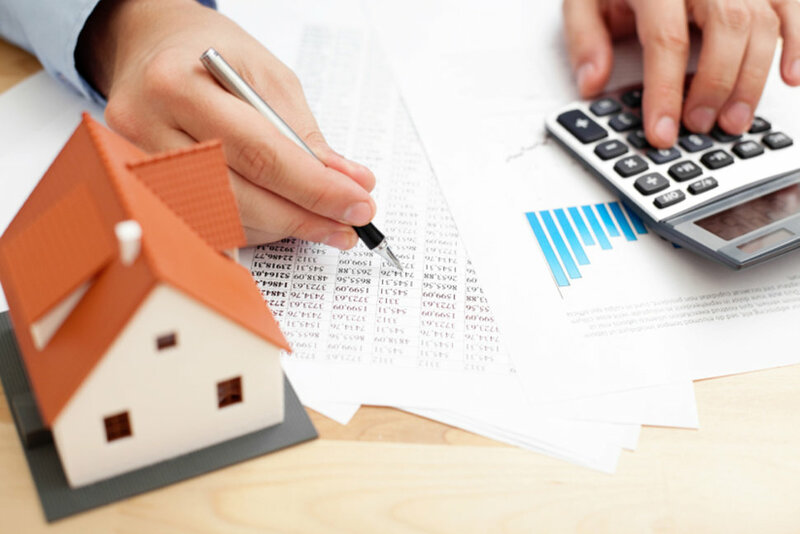 In some cases the current value of the property may be justified based on the projected cash flow. The valuation question just has to be evaluated on a property by property basis. In my area (Denver) there has been huge appreciation in the industrial space, so those properties may not look quite as attractive, but other segments such as apartments and office still look attractively valued.